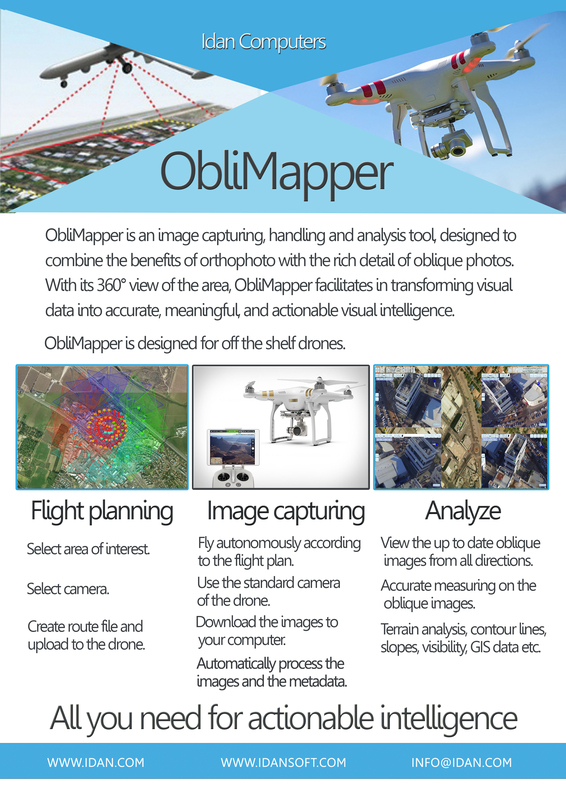 ObliMapper is an image capturing, handling and analysis tool, designed to combine the benefits of orthophoto with the rich detail of oblique photos. With its 360 view of the area, ObliMapper facilities in transforming visual data into accurate, meaningful and actionable visual intelligence. ObliMapper is designed for off the shelf drones. Automatically creates a flight plan for the area of interest. Flies autonomously and captures images by using a drone's standard camera. View up to date oblique images from all directions. Accurately measures the oblique images. Analyze terrains, contour lines, slopes, visibility and GIS data. All of the above actions can be done in less than five minutes after the drone lands. Creates a digital surface model. Measure distance, perform line of sight analysis and annotates objects.